Fishing dry flies is fun, but creating imitations of jumbo-size adult stoneflies is challenging. This pattern has the appearance and movement of a real insect. Fly anglers love stoneflies, and so do the trout. I’ve had big adult salmonflies try to crawl under my hat, up my nose, in my ears, down my collar, and behind my glasses. After a long, cold winter of drifting minuscule midge imitations in front of persnickety fish, there is nothing like chucking large and visible dry flies in front of voracious trout. Unlike dropping dainty emergers and duns during mayfly season, the sound and motion from a well-placed stonefly pattern signifies a dinner bell for all takers. One of the enticing things about large adult stoneflies is how their abdomens move back and forth as they struggle on the water’s surface. This movement elicits savage strikes from hungry trout. Many anglers match stoneflies with a variety of imitations; there are so many, in fact, that a Google search for stonefly dry fly pattern yielded more than 170,000 results. Less than a handful of those flies, however, come close to imitating a wiggling adult. Over the seasons, I have tried finding the perfect stonefly pattern that would fool big trout. I’ve used Randall Kaufmann’s Stimulator to imitate the various sizes, shapes, and colors of stoneflies, and it is still a go-to pattern when I’m fishing dry flies. But what about a pattern that imitates the wiggle of an adult stonefly as it struggles to crawl or swim across the water’s surface? I live in the middle of some of the world’s most prolific fly fishing waters, and they have no shortage of stoneflies: Skwalas, salmonflies, golden stoneflies, and yellow stoneflies. These waters are a veritable test lab for stonefly patterns. The South Fork of the Snake River, with its sister river, the Henrys Fork, are very close to my home. And the famous Madison River is only a short drive from the South Fork. Each river has reliable hatches of various stoneflies throughout the spring and summer seasons. I recently spent an early July day floating the South Fork of the Snake and experienced multiple emergences of salmonflies, golden stones, and yellow stoneflies. The fish were feeding on all three species of insects with no preference for one over the other; if an adult stonefly was on the water, the fish were up and eating. While the Booty Shaker Stone might be better suited for fishing during the summer, start tying it now in anticipation of next year’s season. You’ll have to gather a few materials, and your flies will become better with practice. 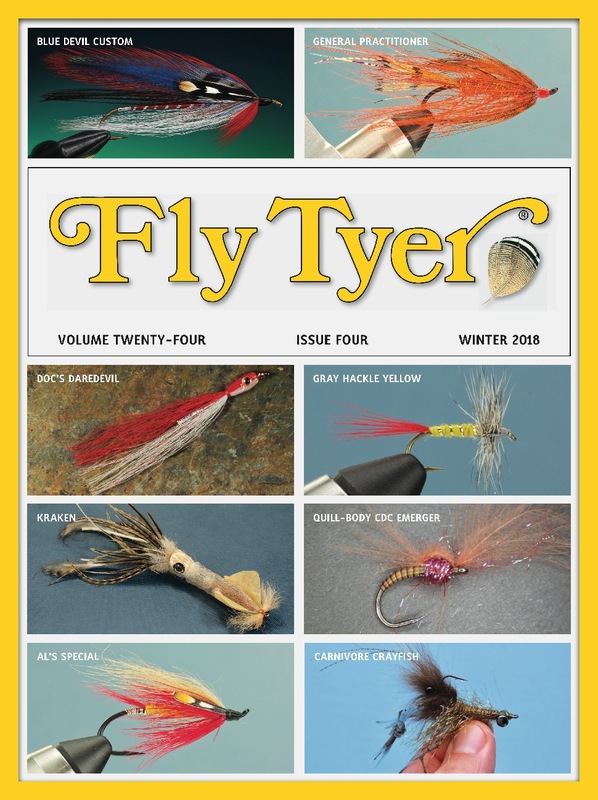 Besides, there is nothing like tying flies and dreaming about catching big fish, unless it is actually being on the water and feeling the tug of a trophy trout on the end of your line. Shank: 55-millimeter Fish-Skull Articulated Shank. Thread: Orange 6/0 (140 denier) for tying a salmonfly imitation, and brown 6/0 (140 denier) for making a golden stonefly. Tails: Rust or orange goose biots for a salmonfly, and dark brown or gold goose biots for a golden stonefly. Abdomen: Two-millimeter-thick closed-cell foam. 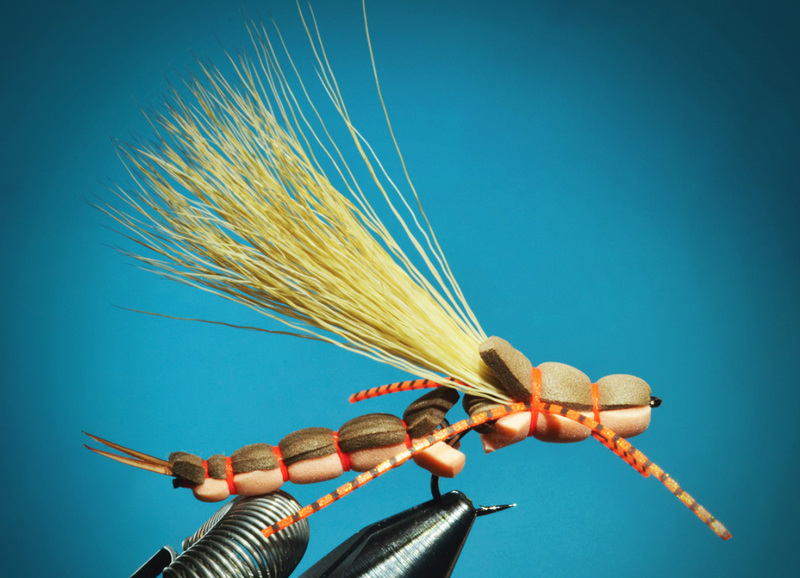 Use orange or salmon-colored foam for the belly, and dark brown or black foam for the back of a salmonfly. Select light tan or pale yellow foam for the belly and dark brown for the back of a golden stonefly. Hook: Gamakatsu B10S Stinger, size 8 or 6. Articulation loop: 1 1 /2-inch length of 12-pound-test monofilament. Wing: Bleached elk hair. Thorax and head: 2-millimeter-thick closed-cell foam—a 3 /8-inch-wide strip for tying a salmonfly and a 5 /16-inch-wide strip for a golden stonefly. Choose colors to match the abdomen of your fly. Salmonflies, known scientifically as Pteronarcys californica, belong to the order Plecoptera and the family Pteronarcyidae. In some regions, they are known as giant stoneflies, but where I live they are known as salmonflies or troutflies. There are several species of golden stoneflies; they also belong to the order Plecoptera, and the family of Perlidae. Knowing the difference in size and color between salmonflies and golden stones, so that you can imitate them effectively, is the most important point. Adult stoneflies make quite a meal for hungry trout. These insects grow as large as three inches long, which is about as long as my pinky finger. When water temperatures dictate, stonefly nymphs migrate to shore and crawl out onto streamside rocks and vegetation. They cling to these pieces of structure, where they begin the emergence process by splitting out of their exoskeletons through their thoraxes. After emerging, adult stoneflies remain stationary long enough for their wings to dry before flying on multiple bombing runs over the water. If the wind is blowing, many adults crash onto the surface, destined to become some trout’s dinner. Also, shortly after emergence the adults will mate on the streamside vegetation or rocks, and the females will return to the water to deposit their sticky balls of eggs. These insects soon drop to the water’s surface— spent and exhausted—and also become prey for feeding fish. Adult stoneflies live up to seven days, so the hatch develops and passes without lingering too long. When the adult insects are on the water, they frantically wiggle and struggle in the surface film, attracting the attention of hungry fish. Large trout will aggressively come to the surface and noisily inhale adult salmonflies; there is no genteel sipping, as when feeding on mayflies and similar smaller insects. Watching a wave of winged B-52 stoneflies flying upriver during an emergence is truly a sight to behold.